The concept looked promising and the Canadian government agreed to fund the study. However, the contract expired before the study could be completed and the government abandoned the project as too costly. Work had progressed far enough to interest the Americans. In July 1954, the U. S. government awarded Avro two contracts worth nearly $2 million to continue the study, and Avro added another $2.5 million. The program remained in Canada but was now owned and controlled by the United States. Avro had named it Project Y, but the U. S. Department of Defense labeled it Weapon System 606A. In 1958, when the U. S. Army and Air Force took control of the project, they named the vehicle 'Avrocar' and designated it the VZ-9AV ('VZ,' experimental vertical flight; '9,' ninth concept proposal; and 'AV,' Avro). The Avro VZ-9AV Avrocar had fill some enormous shoes. The Army strategists looked for a subsonic, all-terrain reconnaissance and troop-transport vehicle, something rugged and adaptable that could replace light observation aircraft and helicopters. They wanted a two-man craft that could perform the traditional roles of the cavalry: reconnaissance, counter-reconnaissance, pursuit, harassment and screening. In addition to its own airframe weight, the saucer had to carry 450 kg (1,000 lbs) including the crew. It also had to hover in ground effect and at higher altitudes, and travel at speeds of about 48.3 kph (30 mph) for at least thirty minutes. In short, the Army wanted a flying jeep. U. S. Air Force planners wanted something else. They asked for a VTOL aircraft that could hover near the ground, beneath the coverage of enemy radar, and then rocket into the stratosphere at supersonic speeds. To satisfy both services, the Avrocar would require a huge performance envelope and rather naively, Avro engineers believed they could build a supersonic flying jeep. John Frost was chief project engineer for Weapon System 606A, the Avrocar. One of the oddest features of Frost's design was its shape. The entire aircraft was a circular wing shaped much like the ubiquitous Frisbee. From a distance, the gleaming aluminum Avrocar looked like the flying discs popularized in many Hollywood science-fiction movies of that era. Frost and his design team powered the aircraft with three gas-turbine engines and the combined exhaust from these power plants drove a "turborotor" mounted in the center of the vehicle. Turborotor thrust passed through a combination of annular nozzles and peripheral jets to generate lift and control forces. On paper, the design promised hovering takeoffs and landings and cruise speeds upwards of 322-483 kph (2-300 mph) at an altitude of 3,040 m (10,000 ft). It was thought that eventually, the aircraft could attain supersonic speeds. A scale model of the aircraft was sent to Wright Field outside Dayton, Ohio, for testing. At first, the test results seemed to confirm Avro's calculations but further review of the data revealed a serious setback. The jet of air generated by the turborotor to cushion the aircraft near the ground grew increasingly unstable at altitudes of more than a few feet. The problem could be solved but it would reduce the craft's high-end performance. The saucer would probably never fly supersonic. Despite this setback, the Americans decided to stick with the program and hoped that at least the Army's requirements for a subsonic aircraft could be met. In the fall of 1959 the first completed Avrocar prototype rolled out onto the taxiway apron at Malton. Avro was already well advanced on a second prototype. Tests on the first vehicle began, using a special test rig to suspend the Avrocar in the air. The results led to immediate modifications to the annular nozzles, a key element to the lift and propulsion of the aircraft. After reworking the nozzle, Avro packed up the Avrocar like an oversize dinner plate and shipped it to the National Aeronautics and Space Administration (NASA) Ames Research Center at Moffett Field, California. 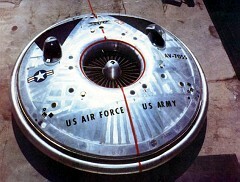 NASA had a wind tunnel at Moffett big enough to hold the VZ-9AV. Meanwhile, Avro finished the second prototype and began flight tests, using a safety tether, in September 1959. The first free flight occurred later that winter. These initial test flights revealed the same problem discovered in the earlier studies. At heights of .9 m (3 ft), the Avrocar exhibited uncontrollable pitch motion coupled with heavy roll. The motion was unique and needed a name so Avro called it "hubcapping." Hubcapping occurred when the cushion of air supporting the aircraft close to the ground became unstable. The problem was so pronounced that flight above .9 m (3 ft) was impossible. The U. S. Air Force conducted two flight evaluations at Malton in April 1960 and June 1961. During these tests, the Avrocar reached a maximum speed of 56.3 kph (35 mph), but all attempts to eliminate hubcapping failed. NASA Ames had explored the other end of the flight envelope in the wind tunnel. They discovered that the VZ-9AV had insufficient control for high-speed flight and was aerodynamically unstable. Adding a conventional empennage (vertical and horizontal tail) did not improve these flight characteristics. The technical problems seemed insurmountable and the U. S. Air Force terminated the program in December 1961 after spending $10 million. Avro's VZ-9AV failed to perform as expected but the effort to build and fly it was not without value. The program revealed, like no paper design analysis ever could, that this was not the direction to go in the design of practical VTOL aircraft. Someone had to bite the bullet, cut metal, then build and fly prototypes to prove beyond doubt that this interesting idea was ultimately unworkable. It was an expensive risk and Avro deserves credit for taking it on. Both Avrocars ended up in the United States. The first remained at the NASA Ames facility after the project was cancelled. The second aircraft that flew the limited flight tests in Canada eventually arrived in Virginia at the U. S. Army's Ft. Eustis Trans-portation Museum east of Richmond, Virginia. In April 1966, the U. S. Air Force contacted the Smithsonian Air and Space Museum to say that the VZ-9AV at NASA Ames was available. In 1975, the National Air and Space Museum took possession of the first Avrocar, serial number 58-7055. The museum currently stores the aircraft at the Garber Restoration Facility at Silver Hill, Maryland. Blake, William B. The Avro VZ-9 'Flying Saucer'. Skeptical Inquirer, Vol. 16, (Spring 1992), 287-291. Douglass, Robert G. Flying Saucers From Canada! Invention & Technology, Vol. 11, (Winter 1996), 58-63. Murray, Daniel C. The Avro VZ-9 Experimental Aircraft - Lessons Learned. Presented at the AIAA Designs, Systems, and Operations meeting, September 1990, Ohio. Avro VZ-9AV Avrocar Curatorial File, Aeronautics Division, National Air and Space Museum. 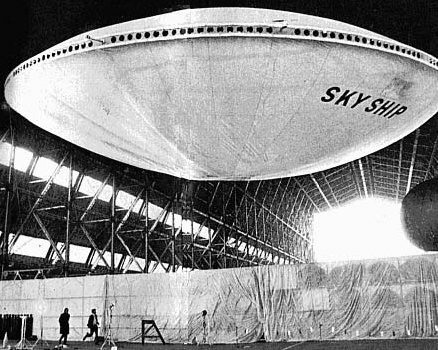 Note: There was also the British-made "Skyship" which was supposedly made in the late 1950's / or early 1960's by the British firm, Airship Industries. If anyone can corroborate this information, or finds it erroneous, please let me know. Thanks to one of our readers, here is some additional information on the "Skyship." In an airship hangar at Cardington, England, on April 17, 1975, a 30 foot diameter scale model of the projected Skyship airship was demonstrated by designer John West. He planned to produce a 200-foot diameter machine with a 6-10 ton payload, and eventually a 400-ton cargo-carrying version. It would have a range of up to 1,000 miles and speed of about 100 m.p.h. The shape was intended to minimise the effect of ground winds and allow for a good load distribution. Vectored thrust from its fan jets would be used for docking. Low operating costs would make it a suitable transport for use in Third World countries.